If you’re into gazing at the sky and capturing its magical beauty, here is your complete guide to the best telescopes for astrophotography. This article aims to help you choose the best telescope so you can take breath-taking photos of the stars, galaxies, and other celestial bodies, right from your own backyard, or terrace. 2. What are celestial bodies? 3. What is focal length? 4. What is focal ratio? 5. What is EMD coating? 6. What is extra low dispersion glass? 8. What is apochromatic refractor lens? 9. What is achromatic lens? 10. What is chromatic aberration? 12. What is field of view? 13. What is FPL 53 glass? 14. What is the Crayford focuser? 16. What is dew shield? 17. What is an equatorial mount? 18. What are andromeda and milky way? 19. What is rack and pinion focuser? 20. What is field flattener? The Explore Scientific ED80 has a focal length of 480mm and a focal ratio of f/6. Weighing around 6 pounds, this scope is compact and light-weight. Its optical surfaces have EMD coatings, and its lens is made of extra low dispersion glass designed by HOYA. This scope uses an apochromatic refractor lens, or commonly known as ‘apo’, which is a photographic lens that corrects color-related anomalies. The Explore Scientific ED80 is the perfect grab and go telescope for beginners to gaze at the stars. Thanks to its size, it’s easy to carry around and set up wherever you deem convenient. Its weight and size also makes it a flexible scope that can be mounted on a majority of mounts. It’s definitely one of the best telescopes for astrophotography for beginners. 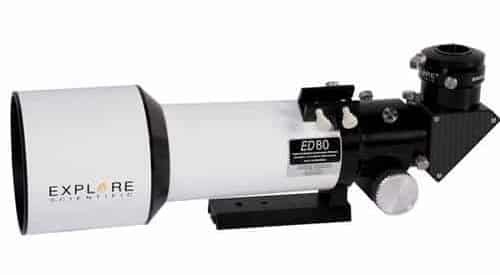 The apochromatic refractor lens used in the Explore Scientific ED80 literally eliminates chromatic anomalies and presents you with spectacular images, unlike many other telescopes. It is a great scope for long-exposure photographs. If using other scopes, you might end up with shaky and blurry images because even the slightest breeze can affect your photography. But not with the Explore Scientific ED80. It offers bright and sharp images because of its apochromatic refractor. If used with a proper eyepiece, the Explore Scientific gives you a great view of the skies, and if used with a camera (see our recommendations), you are going to end up with some beautiful pictures. This is an easy to use telescope, which can be operated even if you don’t read its manual completely. This is an excellent and well-built telescope that is great for both viewing and astrophotography. You can easily zoom in on the stars and have a clear view, and you can just as easily capture the magnificence of Jupiter. Just venturing into the field of astrophotography? Then this is the perfect telescope for you. If you have tried taking photos of the stars with your regular DSLR camera only, then you know what they look like – little bloated balls. 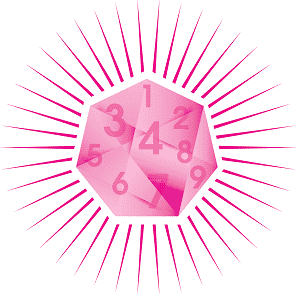 If you want the sharp and pointy stars that you see in pictures on the Internet and TV, then you know what to get. The Explore Scientific ED80 is definitely one of the best telescopes for astrophotography. As a beginner, you can figure it out without a hitch, and its images won’t disappoint you. You can opt for a cheaper telescope but it will not offer you the amazing pictures that you expect. It is slightly expensive compared to other telescopes in the market, but it is worth every dollar, thanks to its bright photos. The Orion 9534 ED80T, like the first one, is also an apochromatic refractor telescope that offers bright pictures. It has a focal length of 480mm and a focal ratio of f/6. 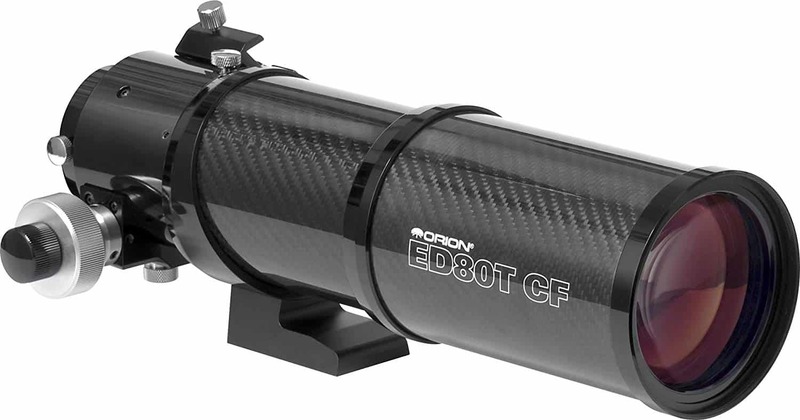 The optical tube of the scope is made of carbon fiber, which makes it lightweight, at almost 6 lbs. The scope features an FPL-53 ED glass, and a dual-speed two-inch Crayford focuser. It also has a collapsible dew shield. It has got the same specifications as the Explore Scientific ED80, except for the FPL-53 glass. The apochromatic refractor and extra low dispersion glass of the Orion 9534 ED80T makes it yet another one of the best telescopes for astrophotography. It presents its user with awesome visual. You can use it to either look at the sky and have your breath taken away, or you can use it to capture photos to take away the breath of others. The telescope comes with a carrying case, which coupled with the size means that you can carry and use this scope wherever and whenever you want. Another amazing feature of the Orion 9534 ED80T is its collapsible dew-shield; not only does it prevent the formation of dew – which can seriously affect your viewing and photography – but it also reduces the glare of external lights. This means that you get crisp images of what you’re viewing. The collapsible dew shield gives you an extra length of four inches, which decreases glare, and prevents accumulation of moisture. Because of this feature, the Orion 9534 ED80T is an amazing telescope for people who love to go camping. 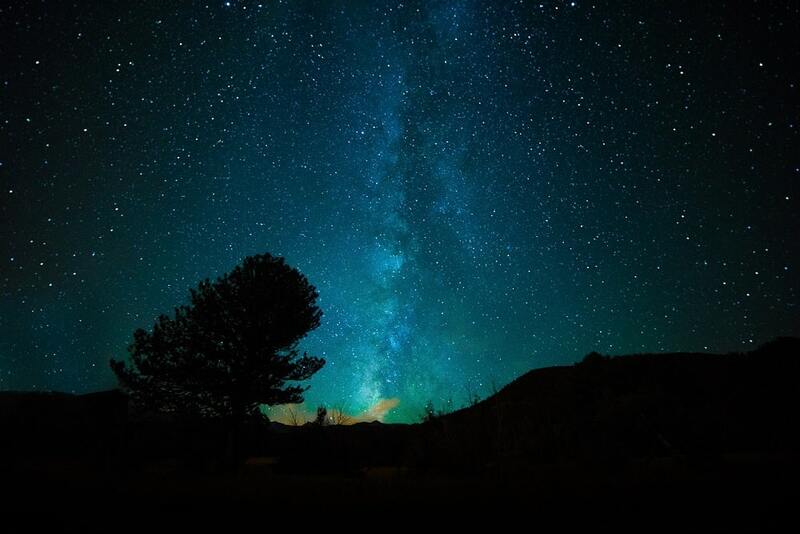 Pack up your bag, your telescope, go out into the wilderness, and capture the wonder of the sky. This scope is a solid and well-built tool, which can be used to view the sky, or take photos of it. The solid build of the telescope can support some heavy cameras and accessories, making your venture into astrophotography a true delight. It can be used indoors, or outdoors, thanks to its various features. Compared to other scopes, the Orion 9534 ED80T is pretty portable. Its compact size, carrying case, and dew shield are small but enhancing features, which make it stand out from the other telescopes. The apochromatic refractor lens used in this telescope makes it one of the best telescopes for amateur astrophotographers, as it gives you really sharp pictures. The focuser is really smooth and precise, so you can easily use it with accessories. However, for advanced astrophotographers, this is not the best option, unless used with a field flattener. Due to its amazing customer service and great built, Orion’s telescopes are popular among astrophotography enthusiasts. The Orion 9788 has a focal length of 203mm and a focal ratio of f/4.9. It features a two inch Crayford focuser, dust caps for focuser and front aperture. Weighing 16.5 lbs, it is a bulky telescope which will hold its ground against wind, and help you take some marvelous photos of the night and day sky alike. The Orion 9788 is basically designed for those who already have an equatorial mount. So, it’s targeted more at advanced astrophotographers instead of amateurs. Its 8 inch-aperture makes it easy to take photos that can be easily enhanced using the imaging optimization options on the telescope. This beasty telescope is easy to set up, and its mirrors are of excellent quality which offers you a beautiful view. It’s a solid-built telescope that’s going to last you a long time. The focusing mechanism of this scope is a little tight, as compared to other scopes. Although some users might not like this characteristic, it is quite helpful because once you focus in on your subject, it’s going to stay there. However, be sure to use a sturdy mount because this telescope is a beast, and if your mount is not strong enough, you might end up moving the mount while trying to focus; and that can become frustrating. The Orion 9788 is a superb telescope that is going to become your best friend for starry nights. It is one of the best telescopes for astrophotographers who are advanced, and also for those that stay in one place. For folks who love going camping and carrying their telescope with them, this is not recommended. It’s a great piece of equipment for viewing and capturing wide-field subjects, so if you want to capture the andromeda or the milky way, you’re good to go. Overall, it’s an incredible telescope for an affordable price, so if you’re an astrophotograph enthusiast who is looking to add to their gadgets, the Orion 9788 is one of the best that you can buy. 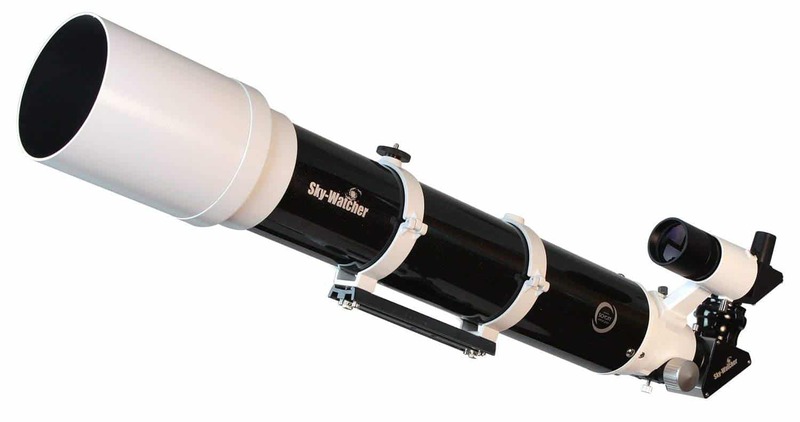 The Sky-Watcher ProED is yet another apochromatic refractor telescope with an aperture of 120 mm and a focal length of f/9. It features a two inch Crayford focuser, and comes with an aluminum case that has a foam lining. It also features a dew shield made of heavy metal. Amateurs venture into the field of astrophotography with great hopes and expectations; Sky-Watcher realizes that expectation and designs its telescopes with such precision and dexterity that viewing the sky, and astrophotography become a truly delightful experience. This telescope comes in two other apertures: 80 mm and 100 mm. Price varies depending on the aperture. This article is going to look into the 120 mm refractor telescope. The 120 mm aperture means that you can get more light in your telescope, therefore giving you a brighter view of your subject. And that is just what an astrophotographer needs. The Sky-Watcher ProED is a doublet refractor telescope, unlike the triplet refractor telescopes discussed above. Doublet refractor lens are called achromatic lens, and they are second to the apochromatic lens which almost eliminates chromatic anomalies. The doublet refractor lens are also pretty amazing at reducing chromatic aberrations, and only very highly skilled or demanding users would find fault with it. Its Crayford focuser helps you focus with ease and precision. Crayford style focusers are one of the best focusers that you can find on a telescope. It makes your astrophotography experience a wonderful one. Although the Sky-Watcher is among the most expensive telescopes on the market, it is worth every buck. With this telescope, you can see and capture coal-black skies with sharp, pointy stars. As one of the best telescopes for astrophotography, the Sky-Watcher ProED is a well-made scope, and although it is not a grab and go instrument, it is still pretty quick and easy to set up. If you are on a hunt for textbook-like pictures of the sky and celestial bodies, then you need not look any further than the Sky-Watcher ProED. It’s an extremely reasonably priced telescope for the quality and satisfaction it delivers. However, if you feel that the 120 mm doublet refractor is over your budget, you can always opt for the 100 mm or 80 mm version. The quality of your visual and pictures will definitely be affected, but the optics and mechanism of Sky-Watcher make each astrophotography adventure worthwhile. The only drawback of this scope is its length. Its length becomes a problem when you try to take an overhead shot; your camera might hit the tripod leg, and that can throw off its alignment. But it’s not a drawback that can not be dealt with. You can easily sort this out by balancing the scope with the camera on its mount and the tube length increased. Now you’re good to go if you want to take an overhead shot. The Meade Apo Refractor has an aperture of 70 mm and a focal ratio of f/5. It is a bulky telescope because it uses four glass elements (FPL-53 extra low dispersion glass) that totally eliminate chromatic aberrations. It features a dual-speed rack and pinion focuser, which has millimeter markings for extreme accuracy. The scope comes with a DSLR camera adapater, an aluminum case for carrying as well as for keeping safe when not in use. When you first look at the price of the Meade Quad, you might start wondering whether it’s worth it. But, considering the accessories that come with it and the quality of glass it has, it is quite an affordable telescope in the market. At a focal ratio of f/5, the Meade lets in a lot of light within a short while, making it one of the best telescopes for astrophotography. The four glass element mechanism of this scope means that you do not need an additional field-flattener for astrophotography. The scope comes with a bracket for attaching the auto-guide; connecting a DSLR camera to the scope is also a simple process that requires no effort. Meade Quad Apo has a rotatable collar with a screw that can be locked, so your framing can be easily adjusted. The best thing about this collar is that it is quite solid; once you lock it in place, you don’t need to re-focus even if you change your subject’s orientation. Because of its quadruplet lens system and focal ratio, the scope presents you with razor sharp images. It’s a well-built and solid telescope that can hold itself against the wind, so you do not have to worry about the wind ruining your photography experience. The 350 mm focal length of this scope means that it is the best telescope for astrophotography if you are looking to capture wide-field images. Guiding accuracy is more lenient when you are shooting as wide. 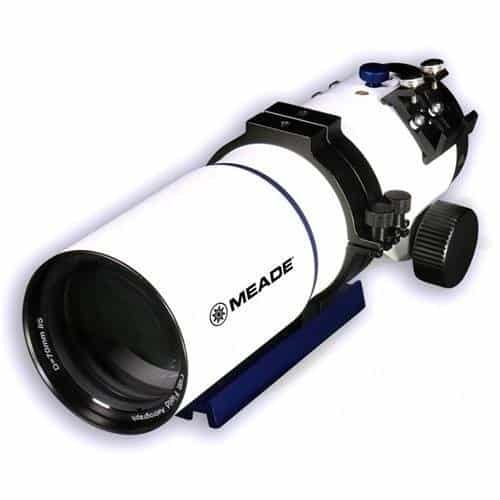 When it comes to astrophotography, there is not one drawback to the Meade Quad Apo Refractor, except for the price tag. It is definitely worth a second thought when you are buying something as expensive, but the telescope is also worth every dollar when you see the quality of pictures that you are going to take. This telescope has been built primarily for astrophotography. At its existing aperture, it simply cannot capture enough light to let you view the finer details of celestial bodies. So, this telescope is not going to satisfy you if you are looking for planetary observation; for that, you will have to buy a larger telescope with a wider aperture. The Meade Quad Apo Refractor is best for wide-field photography. The solid and compact build of this telescope makes it portable, and the aluminum carry case only adds to its portability. And that is why the Meade Quadruplet Apochromatic Refractor is among the best telescopes for astrophotographers who love to go camping. Stellarvue is another one of the best telescopes for astrophotography. With a focal ratio of f/7, and an aperture of 80 mm, the Stellarvue Access is a high-performance apochromatic refractor telescope at a very reasonable price. It features a high-end rack and pinion focuser, and comes with a field flattener so that you can shoot amazing wide-field photos. With this telescope, you do not have to rotate the entire focuser because it includes a collar that can rotate independently. It combines Lanthanum and FPL 53 optics, therefore giving you images free of chromatic anomalies. It also comes with a retractable dew shield, and a carry case. 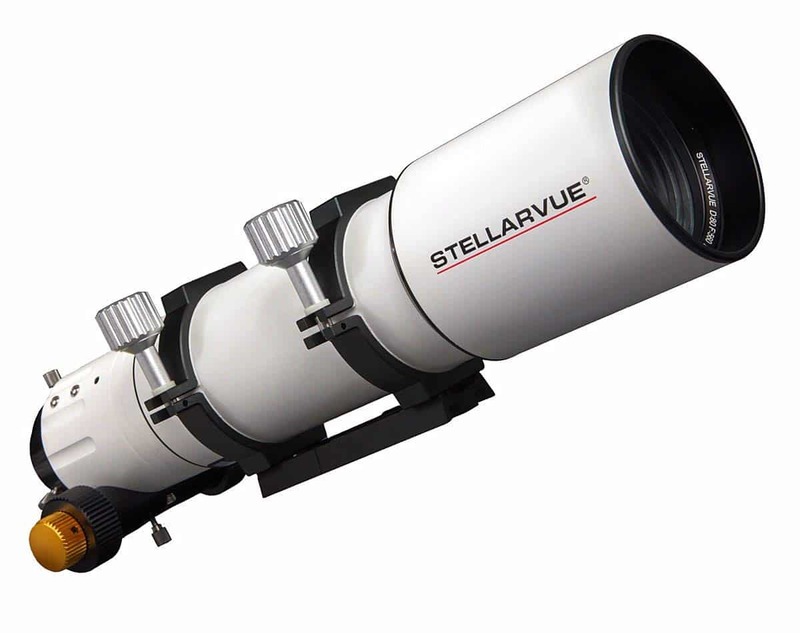 The Stellarvue Access is composed of materials that are intended to bring costs down while maintaining quality, making it one of the most reasonable and best telescopes for astrophotography. Its combination of Lanthanum and FPL 53 ensures that your images are of excellent contrast and brightness, almost free of chromatic aberration. The 2.5″ focuser is a work of art; its smooth dual speed is helpful in both imaging and viewing. The retractable dew shield is yet another amazing feature; not only does it help keep the lens from dewing during night sessions, but also keeps the sun-glare out during day sessions. The tube is painted all black inside so as to avoid reflection, and present you with the sharpest image possible. The eye pieces that come with it enable wide-field viewing and imaging, and you will feel as if you are up in the sky and looking at celestial bodies upfront, and not as if you are peering through a scope. Although basically intended for wide-field astrophotography, the Stellarvue can totally handle simple terrestrial observation. You will see that there is no chromatic aberration, and you will get to see what your subject really looks like. If you are on a budget and want to keep your cost to a minimum while not compromising on the quality of your visuals and imaging, this is just the scope for you. Its combination of high quality optics, high-end focuser that is stable and requires minimal readjustment, and various other features and accessories will ensure a marvelous experience with terrestrial viewing and astrophotography. The carry case and retractable dew shield, combined with the thickly padded carry case, makes the Stellarvue an extremely portable telescope that campers can easily carry and use on their camping trips. Although the scope comes with a field flattener for wide-field imaging, advanced astrophotographers might require another field flattener. The kind of field flattener also depends on the kind of camera you are using. All in all, it’s an incredible telescope at an incredible price that is bound to give you an incredible experience. As this article is intended to be a complete guide on the best telescopes for astrophotography, specially the people that are just venturing into this field, here is an explanation of many questions that might arise in your mind. One of the various kinds of photography, astrophotography refers to capturing pictures of stars, planets, galaxies, and other regions of the night sky. Many observers of the night sky quickly become fascinated with astrophotography, because it helps them see their subject better. The reason for this is that regular telescopes are intended primarily for visual observation, so that’s all they do, whereas telescopes designed for photography of the night sky use special astrophotography mechanism that result in absolutely amazing images, that are much brighter and sharper than the view that regular telescopes offer. Any natural body that is outside our planet’s atmosphere is a celestial body. These include the sun, moon, all the planets, even asteroids. Technically, focal length is the distance between the center and focus of a lens. It’s a measure of how powerfully an optical system diverges or converges light. In layman’s terms, focal length of a lens refers to how magnified your image will be. Focal length is the ‘mm’ number on your lens. The higher the focal length, the more zoomed in your photo, and the narrower your field of view. The shorter the focal length, the more zoomed out your photo, and the wider your field of view. If you look at Explore Scientific ED80 (480 mm) and Orion 9788 (203 mm), you can easily say that the ES ED80 will give you a magnified image, whereas the Orion 9788 will give you a wider field of view. Focal ratio is the f/number on cameras and telescopes. Technically speaking, it is the focal length of a lens divided by its aperture. A smaller f number such as f/4 and f/5 are best for wide-field viewing or photography, and the magnification of your subject is smaller; these are best for deep-sky imaging. Comparatively, a larger f/number such as 11 to 15 offers higher magnification and a narrower field of view; a larger f/number is best for planetary and lunar observation and photography. EMD stands for enhanced multi-layer coating. Optical components, such as a mirror and lens, are coated with one or more layers of specialized material – mostly metals – which changes the way an optic transmits or reflects light. Enhanced multi-layer coatings on optical surfaces are intended to eliminate scattering of light, and improve contrast, therefore resulting in images that are as close to reality as humanly possible. In simple words, dispersion refers to the amount of color that is scattered over a specific area after passing through a medium, such as glass. Lens capture light and focus it onto a single point, therefore giving you a proper view of your subject. When light passes through lens and the different colors of white light are focused on different positions, it creates an amount of dispersion that is called color fringing, or chromatic aberration. What this causes is that you see a slight amount of colors in your image that, in reality, are not on your subject. With progress in science, telescopes now use extra low dispersion, commonly known as ED, glass to avoid color fringing and present its users with near-reality images and visuals of their subject. With ED glass, pictures are sharper and clearer, as compared to traditional glass. HOYA is a Japanese company that specializes in the manufacture of optical products, including glass lenses. Astrophotographers often face the problem of chromatic aberration when using telescopes for taking photos of the night sky. This results in pictures that are not an exact image of the subject. To overcome this problem, manufacturers have designed apochromatic lens, which is commonly referred to as apo. Apos are designed in such a way that three wavelengths – green, blue and red – come into focus on the same level, therefore considerably minimizing, in fact almost eliminating, chromatic aberration. Whereas the apochromatic lens is designed to bring three wavelengths to focus on the same plane, the achromatic lens is designed to bring two wavelengths – red and blue – to focus on the same focal plane. Like the apochromatic lens, these are also intended to minimize chromatic aberration. Chromatic means related to color. Chromatic aberration, often written CA, refers to color fringing, and in photography, CA produces an area of color on edges of high contrast. For example, a white flower against a green background; when taking a photo, there might appear a layer of color on the edges of the white flower petals that in reality is not there. It is a common problem in optics, and occurs when the lens is unable to bring all the colors to focus on the same plane, or the colors are focused on different positions on the focal plane. This is also sometimes called ‘purple fringing’. The technical term for eyepiece is an ocular lens. It is a lens that is attached to devices like microscopes and telescopes, and is the lens that is closest to the observer’s eye when looking through the device. The eyepiece gathers light and brings it to focus on the focal plane so that the observer can get a visual of his subject. Eyepieces have a barrel on one end which is attached to the telescope. Binoculars have fixed eyepieces but telescopes can be used with a variety of eyepieces. Most of the telescopes discussed in this article come with two eyepieces from the company. But, astrophotographers can always get more eyepieces to try with their telescope and see which one is best suited for their needs. Different eyepieces have varying focal lengths and fields of view. It is the extent of area that can be seen when looking through a device such as a telescope. FPL 53 is also known as FD or super ED glass. It’s made by a Japanese company named Ohara, that specializes in the manufacture of various products, including optical lens and glass ceramics. It is easier and less expensive to make lens with this glass as compared to other materials, and is incredible at minimizing chromatic aberration. Crayford focus is among the focusing mechanisms of telescopes. Due to its simplicity, it is used in telescopes intended for amateurs. These are easier to manufacture without the use of high precision mechanism, and offer excellent focus with no backlash. 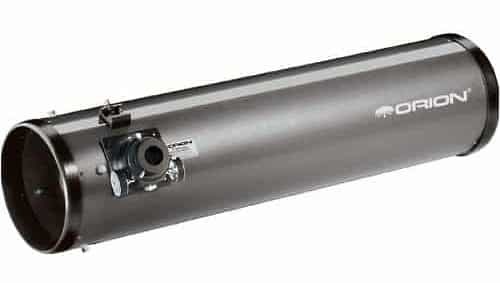 Crayford focuser has a shaft with smooth springs that holds the focus tube, and controls the movement. These are considered superior to the rack and pinion focusers. Backlash refers to when motion is lost in a device or mechanism because of gaps between the different parts of the device. One of the most common problems that astrophotographers face is dewy lenses. Because most of the terrestrial observation and astrophotography take place at night, there is the chance of dew forming on your lens therefore blurring your view, and ruining your experience. For just such a case, telescopes can be used with a dew shield to protect them from night-time dew and ensure an excellent astrophotography session. Some telescopes come with built in dew shields, but for telescopes that don’t have them, there are dew shields and caps that you can easily. Telescopes cannot be used on their own as they are quite heavy to hold in place, and focusing can be a hassle when keeping the telescope steady with one hand. For this purpose, a telescope always has to be attached to a mount to keep it steady and in place, while the observer or astrophotographer concentrate on focusing and imaging. There are different types of mounts available in the market, and equatorial mount is one of them. It has an obvious advantage of keeping the device fixed on a celestial body, which you will experience when you use it yourself. The andromeda and milky way are galaxies: systems of billions of stars, dust and gases. These are the systems that you are going to view and capture when you look through your telescope. This is considered an entry level focuser, second to the Crayford focuser. When a telescope is used with a camera to take photos of the night sky, the image comes to focus in the center, but the edges are distorted or curved like saucers. This is an optical aberration or anomaly that is termed Pvetzal field curvature. To deal with this optical aberration, telescopes require a field-flattener to give the observer the best and flattest view possible. Auto-guide is a tool that is used to keep a telescope focused on the subject, and keep it from drifting out of view during long-exposure photos. Lanthanum is a material that is used in making optical lens, because it offers low dispersion, therefore enabling sharper imaging. Find the best telescopes for astrophotography! Suitable for beginners, intermediates and expert astronomers that love to capture the night sky.